Daily Illuminator: It's The Most Wonderful Time Of The Year . . . For Games! December 21, 2016: It's The Most Wonderful Time Of The Year . . . For Games! Saved all your gift buying for the last minute? Me, too! While I am sure you have checked out our Munchkin Fan Gift Guide and a few different gift guides, I have more suggestions! Munchkin Wonderland – Bring the children to the Munchkin side! Fall down the rabbit hole into the world of Alice in Munchkin Wonderland! With jokes and cute art by John Kovalic, it's perfect for kids 6 and up! 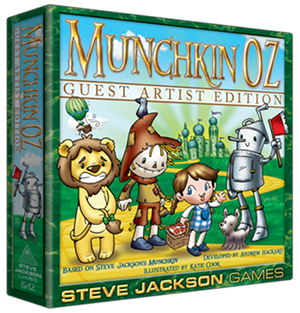 Munchkin Oz Guest Artist Edition – Katie Cook is at it again! Her cute art will make you want to loot Emerald City over and over again! Munchkin Deluxe – Can't go wrong with a classic! Simon's Cat Card Game – Purrfect game for stocking-stuffing or for the first day of Hanukkah! With a low price and cute imagery, what's stopping you from buying it right meow? And of course, you can always visit your Friendly Local Game Store for some awesome-possum gifts! To quote Elf-is Presley, "I have left the building, and gone home to logon to Amazon Prime and buy some neat games."